If you believe the raw red meat’s red juice is blood, you’re wrong. In meat bought from a store, there’ll be very little blood in the red liquid. It’s actually a mixture of water and a protein called myoglobin. The myoglobin is a common protein, which has the ability to store oxygen in muscle cells. The myoglobin has a high level of red pigment, so the more myoglobin the meat has, the redder it will be. 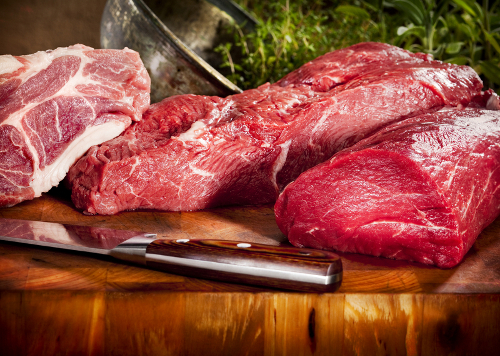 The terms “red meat” and “white meat” are actually an indicator for the level of myoglobin. Most mammals are red meat, because their myoglobin level is high, while most poultry are considered as white meat. This protein is also the main reason that the red meat turns darker while you’re cooking it. During the heating process, iron atoms of the myoglobin lose electrons and they move up to a higher oxidation level. Thus, the meat turns from pinkish-red to brown.